The weather keeps coming and with it comes the water our fish so desperately need all summer! Great news for fish and anglers alike! With nighttime temps in the 20s for the coming week, we should be holding onto this snow until the end of the month. On the Big Wood anglers should expect a return to winter fishing conditions. Expect exceptional Midge hatches accompanied by the Little Black Stones. Be prepared to nymph and fish the dry. Standard winter patterns are all you need; Zebra Nymph, Brassie, Tie-Down Midge and Griffiths Gnat. If you start before the hatches try Streamer fishing. The pre-spawn Rainbows should be very aggressive right now. Silver Creek remains closed, but the water levels are to the tops of the banks, giving the Creek a good flush. Expect an amazing Opening Weekend down here in Picabo! The Lost continues to fish well. Bring all your same Big Wood River patterns and enjoy some of the season’s best fishing near Mackay for the next month or so. Don’t forget the Lost can be a great fall back for Steelhead anglers when the Salmon decides to blow out. That shouldn’t be the case this week as temps remain cold and the forecast isn’t showing a lot of precipitation. Steelhead should be getting on the move up on the Salmon River with a little influx of moisture and daytime temps warm enough to melt some snow off the banks and giving the fish the sign that it’s time to start moving up the system. 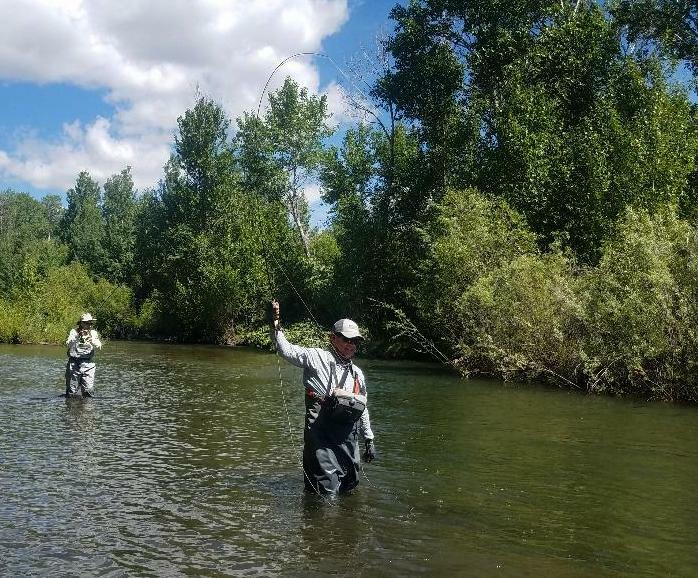 Fishing should be better closer to Challis the next few weeks than the upstream portion, but the fish are where you find them! Anglers fishing the canyon water below Magic Reservoir have been treated to some excellent fishing. It may not be fast and furious, but it is a good place to try for some big fish, both Browns and Rainbows. Watch the wind in Hagerman for the calm days. Those days are ideal for sight fishing Carp in shallow water. Bring “hook up” patterns like you’d fish for Bonefish. Damsel Flies tied with small bead chain eyes are very effective. One thing is for certain this time of year, angles have decisions to make! There is a lot to do and a lot of room to do it. Get out there and enjoy yourself this spring. It is a time of year full of surprises and world class fishing!